he wants no “marijuana stores” in the city. HAYWARD CITY COUNCIL | Medical marijuana dispensaries in Hayward have long been viewed by city leaders with great disdain. Hayward councilmembers, in the past, have labeled them the bane of public safety and a potential corruption of young minds in Hayward. But with a resolution scheduled to be debated by the Hayward City Council this week in support of a bill to place regulatory oversight on dispensaries in the state, is the city rethinking its stance? Assembly Bill 266 would enact a regulatory framework for licensing medical marijuana providers and create an Office of Marijuana Regulation. The legislation authored by East Bay Assemblymember Rob Bonta, was overwhelmingly approved last month by the State Assembly, and also gives local governments oversight over licensing of dispensaries within their cities. For much of the past decade, the Hayward City Council has been one of the most vehement opponents against the perceived overreach into local affairs by legislators in Sacramento, primarily involving takebacks of local tax revenue. Under the proposed bill, local jurisdictions would have the final say in approving and revoking the licenses of dispensary owners. The regulations would also allow cities economically struggling cities like Hayward to create a new revenue stream from administrative fees stemming from the licensing of dispensaries. 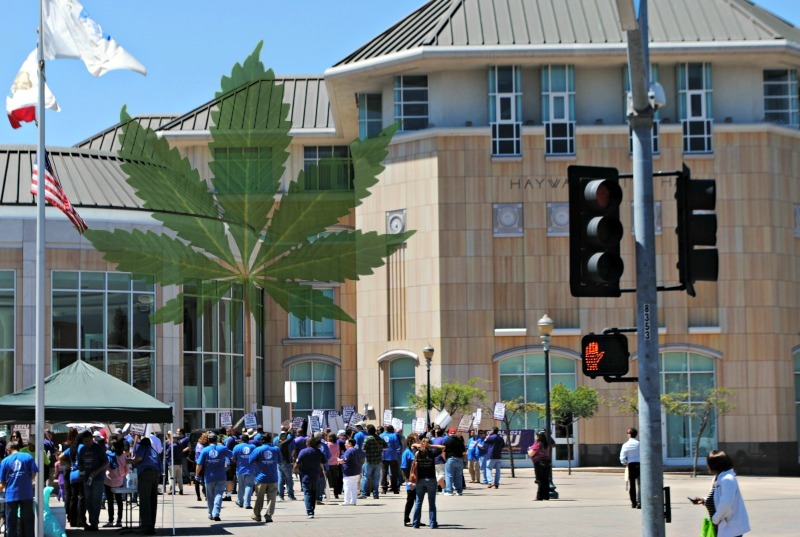 However, while Hayward may support AB 266, strong opposition to medical marijuana dispensaries in the city persists. A bit of pragmatism might also factor into the equation as the state veers closer than ever toward legalizing marijuana. Bonta’s bill is the most desirable of the bunch because it offers local control to cities, the Hayward leaders believe. The wording of the resolution also bears similar sentiment. “The Mayor and City Council and Hayward Police Department strongly oppose any production, distribution, or sales of marijuana within the City limits,” the resolution reads. The issue of medical marijuana dispensaries in Hayward has ostensibly been on the back burner for several years following a moratorium placed on its existence starting in 2010. Among the current set of councilmember Francisco Zermeno has long been one of the strongest opponents of dispensaries in Hayward. Since, at least, 2010, Zermeno has described the medical marijuana as a health care issue better served by hospitals. Just last month, during a council meeting, he declared no “marijuana stores” in Hayward. Posted in AB266, Assembly, bill, cannabis, dispensaries, Hayward, Hayward City Council, legislature, local control, medical marijuana, moratorium, Pot Dispensary, Rob Bonta, sacramento. Bookmark the permalink. It could mean millions for Hayward, but wtf they don't need money, do they? They have enough for the youth center, don't they? This city council needs to get in the 21st century! Money grab for Hayward, since they tax up the wahzu. Since when does Fran David want to turn down money? The new catch phrase is “Welcome to Hayward, Welcome Home!” I guess if Council & Mayor Halliday voted another 100k on the 200k they paid Brainchild Creative to come up with that baloney slogan, they could change it to “Welcome to Hayward, Welcome Home, Unless You Are A Pot Dispensary.” I wonder what the folks from BC were smoking when they came up with that slogan. The Bay area, and including the East Bay, is extremely heavily infested with charlatan and demagogue politicians, and who pretend to be liberals, who are strongly in favor of having medical marijuana clinics, AND FOR THE SO CALLED “GOOD OF SOCIETY,” but who want those medical marijuana clinics to be in someone else's neighborhood or city, but NOT their own city or neighborhood. So if the demagogue politicians in Hayward are truly in favor of the idea of having medical marijuana clinics, let's not only put them in Hayward but even on the same streets those Hayward politicians live on and also very close to the schools their children and grandchildren go to. Not only medical marijuana, but all marijuana will be legalized in 2016. Get with it. It's safer than alcohol and tobacco! If you don't want it, don't use it. It's also safer than many pharmaceuticals including over the counter. The public supports it by an ever growing majority! If the Lockyers still have a house in Hayward, then far and away the best spot for a medical marijuana clinic in the Bay area would be on the block the Lockyers live on, in other words within easy walking distance for Nadia, and who is a horrible driver, and so that way she would not have to drive to get her drugs, and therefore further endanger herself, her children, and other drivers. In fact since she is also an alcoholic, and I suspect still furthermore on meth and/or other additional drugs, so as to make as much money as possible, any medical marijuana clinic located on the same block in Hayward as the Lockyer residence should also be allowed to sell a full and complete line of drugs, liquors, and other stimulants, and including two hundred proof whiskey, meth, cocaine, heroin, speed, bath salts, and quaaludes, etc, etc, etc. Back when Kevin Dowling was an aide on Alice Lai Bitker's staff (at the time she was on the Alameda County Board of Supervisors and represented San Lorenzo and part of Oakland), Dowling, and who I believe at the time was already living in Hayward, was an extremely strong advocate of having medical marijuana clinics in certain locations in Alameda County (but NOT in Hayward), and including a particular location on the line between SLZ and Castro Valley that would have provided easy access to medical marijuana for teenagers and young adults in both San Lorenzo and Castro Valley. However when Dowling was later elected to the Hayward City Council (and which caused him to leave ALB's office, and therefore to no longer have direct influence on AC affairs related to medical marijuana, but only to issues directly relating to Hayward, suddenly he did an about face and became very strongly opposed to having medical marijuana clinics, or at least having them in Hayward, and where with his spot on the Hayward City Council he would have had considerable power to establish such. So let's totally prohibit having medical marijuana clinics in the unincorporated areas, and such as for instance San Lorenzo and Castro Valley, but instead put them in Hayward, and including on the block that Kevin Dowling lives on.